Sometimes life can seem so full of mundanities: getting up, going to work, getting children out to school on time, eating, housework, looking after children, going about your daily business and so on. Each day can feel the same and time passes quickly. One week turns into a month and seasons change before our eyes. And you wonder: Am I making a difference? You most likely are. Even when you don’t realise it. It’s often the everyday events that change lives. One little idea, one smile, one hug, can make a huge difference to someone else. It is in the talking everyday to your child in the car that builds up a strong relationship that will last a lifetime. It’s in the keeping the routines that your children grow up feeling secure and loved. It’s in the going to work everyday that you build up character and faithfulness and in the looking after young babies that you get to know and understand the uniqueness of each of your children. It’s in the everyday things that you are making a difference. I’m a stay at home mum with two preschool children. They both have special needs. My everyday life is full of mundanities. Everyday can be the same mix of eating, washing dishes, playing with children, cleaning, washing children, dressing children, changing nappies, taking them to activities, ensuring they get to and from nursery and doing the same bedtime routine night after night after night. I often feel I am not getting anywhere or making any difference. This can feel so much worse because of my children’s developmental delay and autism. I can feel trapped by their insistence on sameness and lack of progress. It can get boring reading the exact same bedtime story every night. But then they achieve something. Sometimes just a tiny little thing. Sometimes something quite amazing and significant. And you realise you are making a difference to a life. For four and half years I have taken my children shopping. My daughter now understands basic concepts like choosing a product, having to wait until you have paid for it before it becomes yours, handing items over to cashiers to be paid for and even that coins, pieces of paper or plastic cards can be used as payments for items you want. I can see through her play that she can use a toy till and role play being a customer or cashier. But my son has just sat in a trolley seat for 4 and a half years staring into space…until this week. This week he reached out for an item when shopping, held the item around the store and then…to my amazement…placed the item onto the conveyer belt at the checkout to pay for it! He screamed for the item to be returned very quickly into his possession but he is learning slowly. He still can’t yet form a point or say the words required to ask for something but he is slowly becoming more aware of the world around him. He knew the item he wanted had to be paid for and that you put it on a belt and then get it back. He has been taking all this in while staring at the ceiling lights for 4 and a half years! We are making a difference to him. His nursery teachers are making a difference. His speech therapist is making a difference. Taking him to church and clubs every week is making a difference. Our everyday life is slowly helping him progress. Another new thing he is now doing is holding whatever is in his hands up and looking at us. Speech therapists refer to it as showing joint interest. He is wanting feedback from us. He is wanting to know what something is, or perhaps what colour it is or what it does. He is aware of us so much more! He sees we can teach him something. He wants to share something that interests him with me. Wow! Parents so often take these tiny things as so trivial but in my world these stages are beautiful moments worthy of excitement and mention. It doesn’t matter what it is he is showing me. It doesn’t matter how chewed it is or how obscure it is. He showed me a label off of a pair of socks today several times. I would have discarded without thought but to him it held interest and he wanted me to share in that interest. So I looked at his label with him and told him countless times that it was a label. We are interacting. Strange title I know but it sums up my week! It has been interesting to say the least. I’m such a people person and I like to talk. Funny how God does things and I have two children, one who can not speak and one who doesn’t like people being near her! If I hadn’t given birth to them I would wonder if they were mine some days. God certainly has a sense of humour I believe. And if there is something I really love it is meeting other families, other parents who can relate to my journey of raising two additional needs children. So I like to frequent carers support groups, children’s clubs for special needs children and training meetings whenever I can. I tell folk it’s for the children but most often it’s me who benefits most. There’s something comforting to be surrounded by other people who do not judge, who accept your children for who they are and who want to support you. So if I hear about such groups I quickly get the diary out and see how many I can squeeze in around hospital appointments, speech and language appointments, pediatrician appointments and all the other multiple professionals who are involved with my children. And if the children can come with me all the better. It’s good for them to socialise but does me even more good to get out the house. It’s not good to be isolated. This week I have been to parent support meetings, a meet up at soft play and two children’s clubs with the kids..and it’s only wednesday! I have also taken the children to friends houses to visit too. My daughter did announce in disgust to her dad this week though that “mummy talks too much”. Ok point taken Naomi. There are advantages to having a non verbal child…! “Oh there’s been some jigsaws chewed. That could be mice.” No sorry that was my son. “I have found some chewed chocolate under the couch. That’ll definitely be mice.” Ermmm I think that was my son too. “In your kitchen I have found what could be mice dropping.” Actually that’s looks like coco pops my son dropped. You have no idea how far those blighters can get! “And could your son have gotten behind your kitchen bin and bitten tiny holes in a discarded tomato ketchup sachet? Oh we might actually have mice then! Unsurprisingly he never suggested putting poison down. Oh yes Isaac would have eaten that for sure! So we lured our dear mice ‘friends’ in with chocolate spread and hide the traps as far away from sight as possible (I knew there would be an advantage to my son only seeing out one eye!) And rather than the infestation the chewed toys and food suggested we caught just 5 tiny mice. The majority of the chewing was indeed my son. But I was still terrified of those creepy mice! At least I had a funny story to tell at my next meeting! Three days have passed now and although there is still plenty chewing and biting going on in the house it certainly isn’t those pesky creatures with four legs…just the bouncy, playful, cheery two legged kind called children. We never mentioned our little visitors to the children. One would have perhaps thought it was a new delicious sounding meal, the other would have been traumatised. I’m with the second one personally. And in all this the kids have been…well behaved! They have had a friend over to play and been to others houses and they have played nicely (all be it not talking or looking much at the other kids) and not screamed or had a public tantrum for days. Are you one of those shoppers who reads the labels before buying a product? Do you want to know how much salt it contains, whether it has any artificial products in it or even just how long a use by date it has? Or do you just recognise familiar brand labels and put them in your trolley because you know your kids will eat it? Whatever you do the label serves a purpose but without opening the product you still won’t know what it is actually like. ‘Autism’ is a label that was given officially to my son on 31st July 2012. It is a label he will have for life. Some people see his label but don’t see him. Others use the label to get a better understanding of his behaviours and tailor his education to suit his needs. Some see his label as just an excuse for anti social behaviour. Still others are frightened by his label. Many do not understand his label and a few see past his label and get to know Isaac. And even fewer are interested enough to read the small print and see the other labels he has such as global developmental delay, severe learning difficulties and neurofibromatosis type 1. But this is only how those areas affect Isaac. Everyone with autism is so unique and the areas of difficulty can affect people in all different ways. 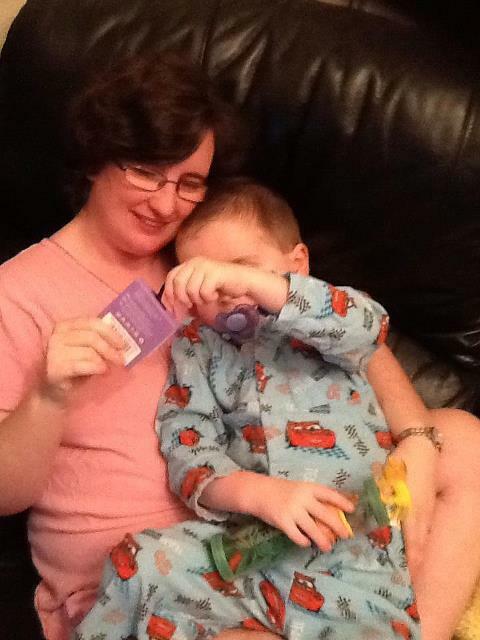 It is very likely Isaac’s twin sister will also be diagnosed as having autism later this year. But, she can talk fluently, gives good eye contact, is socially aware and academically thriving. Yet they could both have the same label. Because a label can not define a person. You have to open a tin of beans and taste them to know what they are really like. For all a washing powder label says it gets “rid of every stain known” until you try it on your childs ground in blackcurrant juice stains you will never know how good it is. Please don’t be frightened of my childrens labels or diagnosis. And please never let it define them. They are funny, boisterous, happy, loving children who are unique in every way. Autism helps us understand them but it will never define them. 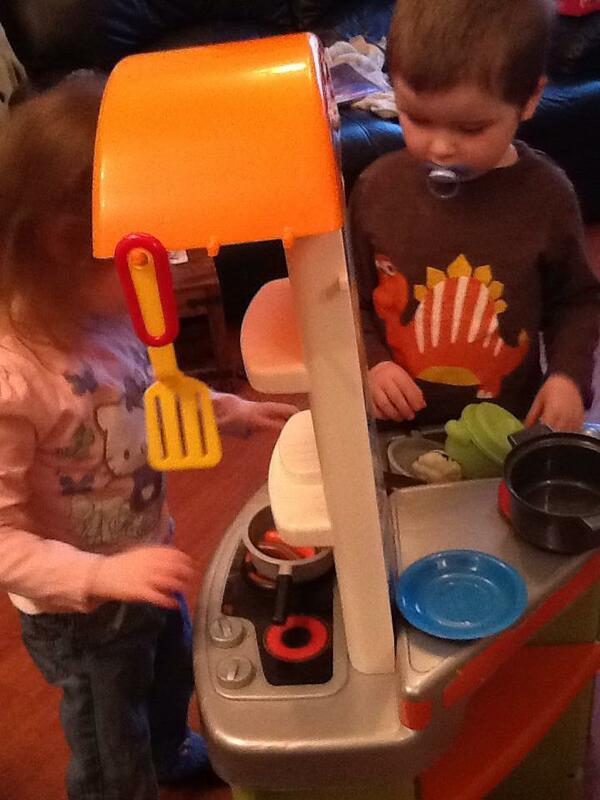 Here they are playing together with a toy kitchen. Communicating, interacting, using imagination and experiencing all sorts of sensory feedback like noise and colours and movement. Because no label can define them! I’m thankful that tomorrow is a new day! As well as blogging I have been trying to keep a little journal of thankfulness recently. Some days it is very easy to think of plenty to write and other days I have to really dig deep to see the good that has happened that day. But I can now look back at almost a month of written thoughts of thankfulness and I wanted to share some of the things I have been so grateful for and the little tiny seeds of progress that give me hope for a brighter future. For those of you who haven’t read previous blogs or my history it will make more sense to you to know that I am a mother of 4 and a half year old twins conceived through IVF after a ten year struggle with infertility. Both twins are on the autistic spectrum and one of them is diagnosed severely autistic with global developmental delay, severe learning difficulties and neurofibromatosis type 1. He also has eye problems. Both are still in nappies and one is completely non verbal. During the last month we received difficult news regarding my son’s eye sight, my daughter has been referred for further tests regarding bladder issues and I have been struggling with my own health problems. We are also in a battle with the local authority regarding my sons future education. It is in the midst of all this that I want to share some of my notes on thankfulness. Because it is in the midst of trials that we most need to have hope and stay thankful. I am thankful for the NHS and for people who choose to work unsociable hours to be able to treat myself and my children. I am thankful for friends who call, text or e-mail and just say they are thinking of me. I am thankful I can see my children smile. I am thankful my son went 24 hours without biting himself today. I am so thankful my son allowed us to measure his feet in a shoe shop for the first time ever without screaming. This is progress. I am thankful for a husband who sees all my faults but still chooses to love me and be with me. And thankful that I have a God who is just the same. I am thankful for the fact my son appears to have good vision out of one eye and has no sign of tumours on that eye either. I am thankful for transport to be able to make appointments even when we have snow in Spring! I am thankful to know what is affecting my children and causing them to behave the way they do. Understanding brings knowledge and helps me focus better on how to help them and pray for them. I am thankful my son said ‘mum’ for the first time. He isn’t saying it consistently yet but it WILL come. Something like this gives me hope. I am thankful I can hold my children at the start of every day and at the end of every day. Whatever happens in between I can still hold them close and kiss them and whisper “I love you” in their ears. I am so thankful for my daughter who gets so excited over the little things that others overlook. Her thrill at getting a new dvd makes me thankful for her simplicity and gratitude and love. I am thankful I got to use the bathroom in peace on one occasion today. I am thankful for people who have walked similar paths before me and who are willing to guide and help me through challenging times. I am thankful today for a warm comfortable house, a bed to sleep on and food in my cupboards. I am thankful for a God who hears my cries and knows my inmost thoughts.